The Wolverines Academy program was launched in 2018. This is the Wolverines Academy program story as told by Tom Jones, President of Iridium Technology. If you are new to this page, please start reading at the bottom of the page so you get the Wolverines story in chronological order. It was Children’s Day in Thailand on January 12th. Iridium was honored to be able to pitch in for the big party and new backpacks for all of the kids! All of the Wolverines with their new backpacks! The smile says it all - there is nothing better than a giant hot bowl of rice soup! Wolverines Forever: I have set up a personal “Donor Advised Fund” (DAF) to make sure that the Wolverines initiative will continue forever. The way that DAF works is that you contribute funds to an account that can only be used for charitable donations. There is no timeline for when all funds need to be dispersed so that the funds can be invested with a long-term stance, and contributions can be paid out while the principal amount grows. I contributed enough funding to assure that I can cover the monthly Wolverines scholar expenses, and still have the fund principal growing. Note that Iridium also makes a monthly contribution in addition to my contributions. I still have some work to do with my accountant to create a registered 501(c)(3) charity for the Wolverines, and I hope to it have set up by early Q2. The bottom line is that the Wolverines Academy and Wolverines Scholars will now be funded forever! Focus on Getting Students through University: There is an unlimited number of problems in the world, and the same is true for the hill tribes in Northern Thailand. My vision for the Wolverines Academy is that all investment will go specifically for getting as many hill tribe students as possible to complete university. Generally speaking, Thai families are run as a team. If one child is a computer engineer and another is a policeman, they both contribute their vastly different salaries to the family pool, which is then applied to raise the level of the whole family. This means that our litmus test for how funds should be applied is “will this get more kids into the university and then help them to graduate.” We now have five Wolverines scholars on our scholarship program: four are in high school, and one is already in university. We are sharing their profiles below. Additionally, we have five more kids coming into the scholarship program in January. The scholarship program is designed to motivate the kids to get into university. The high school kids get 300 baht ($10) per month if they are maintaining good grades and are on track for the university. The university kids get 2000 baht ($60) per month as long as they keep their grades and are on track to graduate. The primary goal is that the scholarship gives them spending money, so the kids don’t need to do manual labor. They instead can focus more time on their studies, get better grades, and increase their chances of getting into the university. When you meet our Wolverine Scholars below, you will see that they all have difficult situations and significant challenges. That being said, these are tough kids, and my wife and I have been extremely impressed with their resilience and their initiative to improve their lives and the lives of their families. 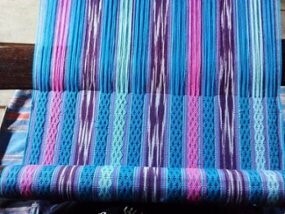 Hand-made Table Runners: Before we meet the scholars, I want to share with you one of the ways that the women in the remote villages earn money. 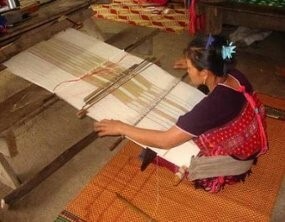 Working on hand-looms, they create these incredible table runners. Each one is handmade, and each family has their pattern that has been passed from grandmother to mother to daughter. Their problem, of course, is finding a market for their products! My wife and I ordered thirty of them, and I will be using them as gifts for our client contacts that take reference calls. Once the Wolverines Academy is set up as a registered charity, we will also be able to sell them online. I would last about five minutes sitting in this position. Wolverine Scholar #1: Pacharapa Panakunkhow (“Naat”). Naat is already in the university studying nursing. Her father died of cancer in 2011. Her family consists of Naat, her mom, her ailing grandmother, and two other kids in high school. Her mom did not complete high school, and their family lives on at a subsistence level. Naat is the first person in the entire village to ever go to university. Naat did well enough in high school to earn the Princess Scholarship, which is covering some of her university expenses. We are providing Naat with an additional 2000 ($60) baht per month so she can focus on her studies. Wolverine Scholar #2: Teepor Kengchallai (“Tee”). Tee is 16 years old, in tenth grade, and wants to be a teacher. Her only hope is to be selected for the Princess Scholarship. Her parents are rice farmers living in a small village. Neither of them completed the 8th grade. Because her village does not have a middle school or high school, she is boarding at the nearest high school about forty kilometers from her village. There are 600 kids at the high school, and 100 of them (including Tee) are boarding at the school because they are from the villages. You can guess how those kids are treated by the “town kids.” As part of the terms of the boarding, all of the village kids have to clean the school, work in the kitchen, etc. They don’t have nice uniforms and shoes (and houses) like the other kids, so of course, they are continuously ridiculed. And to make it worse, most of the village kids need to work in the evenings and weekends to pay for their school supplies. So basically, the town kids get to study in the evenings and weekends, while Tee works three part-time jobs: doing ironing and laundry, cleaning homes, and working in the rice fields. Against all the odds, Tee has persevered and stayed in school while maintaining a 3.0 GPA, which is good enough to apply for the Princess scholarship. Wolverine Scholar #3: Janjira Panakunkhow (“Janji”). Janji is Naat’s younger sister. She is going to boarding school and is currently a sophomore. Her grades are good, and she is also hoping to win the Princess Scholarship and be a nurse. 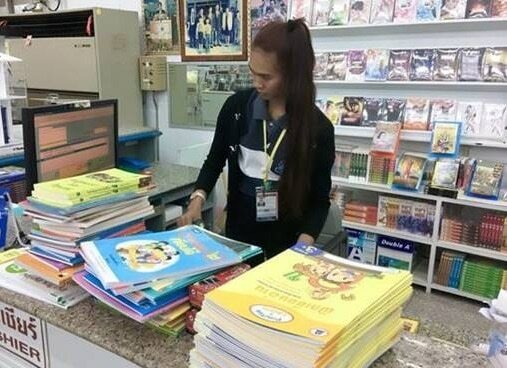 As a high school student, she gets 300 baht per month ($10). As mentioned before, while it seems like a pathetic amount, we had in-depth discussions with Pongsak about what is the right amount. He strongly advised us that anything more than 300 baht per month would be too much. Janji goes back to the village on all school breaks to help her mom and grandmother. Both her and Naat are highly focused on being good role models so that their younger brother will also make it to the university. 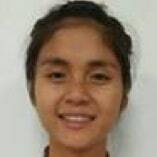 Janji likes playing volleyball and Thai volleyball (which is played with your feet). Wolverine Scholar #4: Miaekue Phalenot (“Mi”). Mi is a senior studying agriculture and plant science. She has 3.46 GPA, which is well above the standard to apply for the Princess scholarship. She is the oldest of four kids and attends the same boarding school as Tee. Her parents are subsistence farmers and dropped out of school in the sixth grade. Both parents have health problems that prevent them from doing too much work. Mi likes science classes, and is the President of the Plant Biology club. She wants to be a teacher. She describes herself as hard-working, and says that she has a hard life so “she can never stop working her hardest to work for a better life.” She is funny and cheerful and likes playing volleyball and Thai volleyball. When school is on break, she walks for 14 hours to get back to her village. 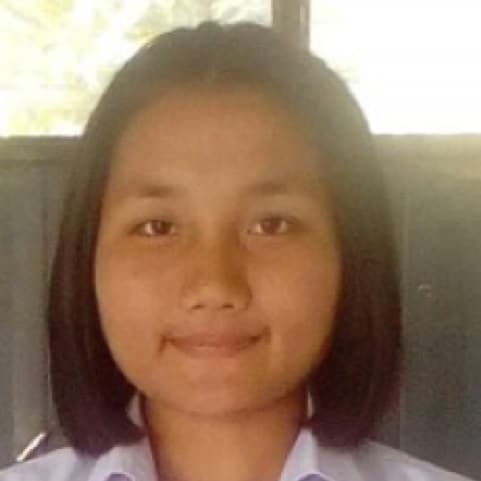 Wolverine Scholar #5: Chawanwat Yotyingapiram (“Tuja”) Tuju is 17-years old, and is a freshman at the same high school as Janji and Mi. He is our strongest Wolverine scholar academically, with a 3.84 GPA. He is the fourth of five kids. His parents are subsistence farmers, and their total income per year is 5000 baht ($150). This gets back to our point about the scholarship amount: 300 baht per month for Tuja is almost as much as his parents are making. His oldest brother and sister both dropped out of school before 8th grade. Brother number three is a Buddhist monk, a noble calling, but unfortunately not helping the family. Tuja is taking every science class available: physics, chemistry, biology, and math. He wants to be a doctor and is such a highly motivated kid that we will be shocked if he doesn’t achieve it. He loves playing soccer and has organized an after-school soccer program to encourage the students to stay away from taking drugs. Finally, because the Wolverines commit to helping other Wolverines, Tuja is tutoring Janji and Mi to help them with their math and science classes. The Village Elephant: One of the 7-year old kids disappeared for three days, and Pongsak was wondering where he was. 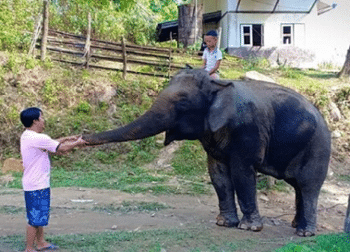 He showed up at school riding the village elephant: his 17-year old brother had taken him and the elephant into the jungle for three days so the younger brother could learn how to take care of the elephant. This elephant is a female, and she has two jobs: (1) haul trees out of the forest, and (2) have as many baby elephants as possible since they can be sold for a reasonable price. Five families in the village take care of the elephant together. No, the village elephant did not qualify to be a Wolverine Scholar. Two wolverines hunting frogs at night - any meat is good meat. Everyone is pitching in on the bathroom renovation. This young girl is "Palmee" (which means good luck). It seems to me that every time there are pictures of the kids working on some tough project she is doing the tough work. Here she is hauling rocks and sand to be used for making concrete for the bathroom. I had my wife ask Ponsak about her - she is nine years old, a good student, and a very hard worker. Note that these kids and their parents are quite small; when I saw her in the pictures, I just assumed she was five. I am hoping that the protein and multi-vitamins are going to help them to grow a couple more inches by the time they are adults! We committed to sponsoring ten high school kids in Thailand to help them to qualify for the “Princess Scholarship.” Our program is evolving, and we are excited about our latest direction. Now that Yuwadee Srichinlers (our formal Iridium Scholar) has graduated, we wanted to find a way to get better leverage with our donations. We discussed it with our teacher Pongsak, and he thought that the “Princess Scholarship” might work well for us. The scholarship is merit-based and will cover university expenses for young men and women from the regions where we are focusing our Wolverines Academy efforts. In exchange for the free university education, the students must commit to returning to one of the small villages to work as a teacher, nurse practitioner, or another role that is needed in these regions. Our plan is two-fold: (1) to get as many high schoolers as possible into the scholarship. We will accomplish this by providing mentoring (Pongsak) and financial support (Iridium and the Jones Family). The second part (2) is to offer more substantial financial support for those students that get accepted. It would be perfect if we can set them all up with laptops and a monthly stipend. Without further ado, I am proud to introduce Teepor (“Tee”) Kengchallai. 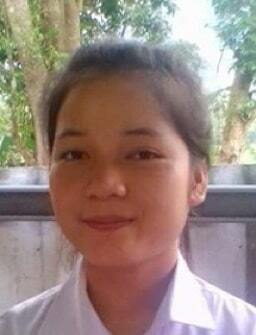 Tee is 16 years old, in tenth grade, and wants to be a teacher. Her parents are rice farmers living in a small village. Neither of them completed the 8th grade. Because her community does not have a middle or high school, she is boarding at the nearest high school about 40 kilometers from her village. There are 600 students at the high school, and 100 of them (including Tee) are boarding at the school because they are from the villages. As part of the boarding terms, all of the children from the villages must clean the school, work in the kitchen, etc. They don’t have the nice uniforms, shoes, and homes like the other kids, so they are often ridiculed. 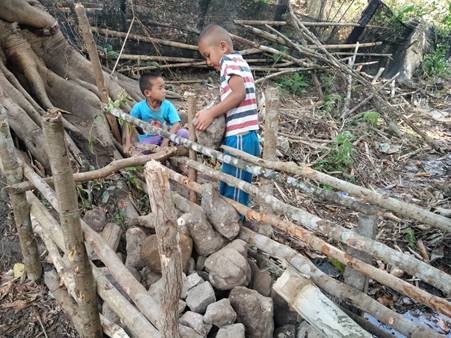 In addition to working at the school, most of the children from the villages have to work in the evenings and on weekends to pay for school supplies. So the town children get to study in the evenings and weekends, while Tee works three part-time jobs doing laundry, cleaning homes and working in the rice fields. Against all the odds, Tee has persevered and stayed in school while maintaining a 3.0 GPA, which is good enough to apply for the scholarship. In addition to our continuing support of our Wolverines school, we are committing to sponsoring Tee and nine other young men and women in a similar situation. 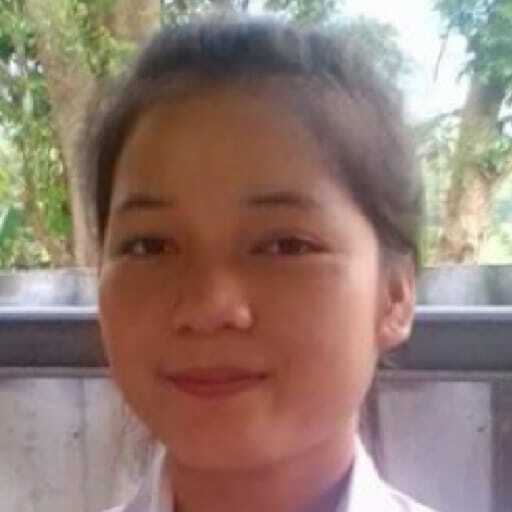 Pongsak has activated the “rural teacher grapevine” to help us find nine more deserving children. The small give is to provide $10 per month per child to help them with supplies so they can study instead of working in the rice fields. They have to get a 3.0 to keep the funds. And we are also going to set them up with a new uniform and shoes at the beginning of each school year (about $30), and cover the cost of new books (another $40). The big give will provide them with significant support while at the university. We debated with Pongsak about how much money to give the kids. 300 baht ($10 per month) is a small amount, and we could certainly do more. But this covers what students can earn with their part-time work, so it will give them more time to study. We will see how it goes for the first couple months, and then make adjustments. Ultimately, when the students return to their communities, they will be instrumental in setting up new Wolverines Academies. 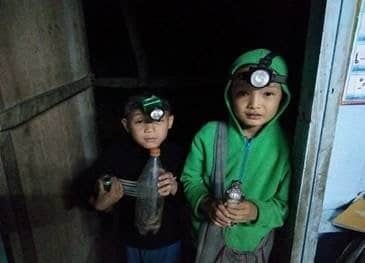 I know that everyone has been following the story of the Thai boys trapped in the cave, and I truly think it is a miracle that they all got out alive. Many of you probably saw the follow-up story that many of the boys are “stateless” – while they live in Thailand and attend school, they are not Thai citizens, or rather citizens of any country. To quote the coach: “To get nationality is the biggest hope for the boys… in the past, these boys have problems traveling to play matches outside of Chiang Rai because of travel restrictions that accompany their lack of status.” About half of the Wolverines are also stateless. Honestly, I am not worried that they can’t travel for school activities, but I am anxious that being stateless effectively bans any of them from attending a university in Thailand. My wife and I are having discussions with Pongsak, the Wolverines’ teacher, for several months about how we can get citizenship for those kids. All indications are that this will be difficult and long process, but we are hoping that the plight of the “Wild Boars” will bring some changes to this process. Getting stateless status removed for all Wolverines is part of our long-term plan. 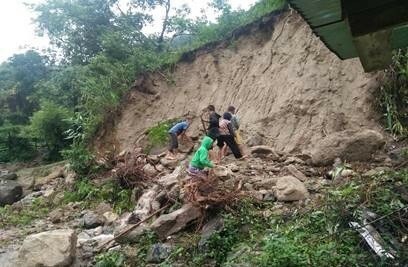 Rainy season in Northern Thailand is no joke, and they had a landslide right next to the school. Thankfully all the kids and the school were spared. 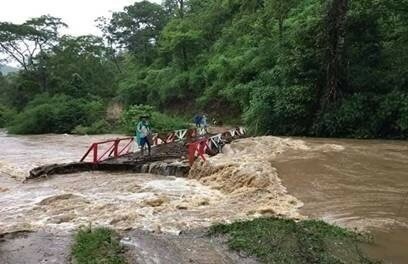 Additionally, the bridge on the only road to the village was washed out. This meant that all the food and supplies that we ordered for June was dropped off at another village since the truck could not get through. The solution to pick up the food? 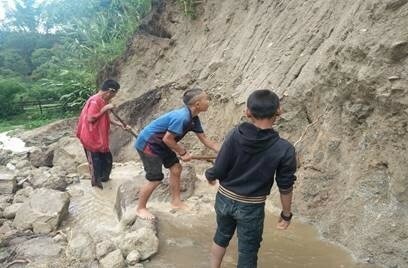 The teacher and a dozen of the biggest kids will walk seven kilometers on the muddy roads to pick up the food and supplies and carry it all back. Now that is being tough like Wolverines! Mudslide right next to the school building. As a result of the mudslide, water was redirected to the school building. Solution? Send some aspiring 12-year old engineers up to reroute the water. Unfortunately, all of their old shovels broke, so we will need to order more. This is the kitchen and dining room. 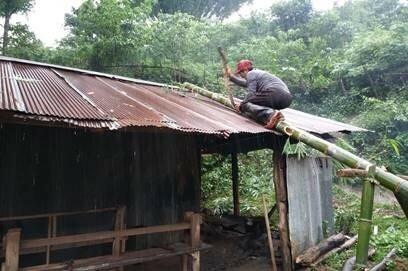 The storm tore a hole in the roof, so our teacher Pongsak is repairing it. No one in the village has a ladder, but you can always build one in an hour or so from a few stalks of bamboo. The bridge is out, and will not be prepared until the rainy season is over - another 10-12 weeks. School has started and we have 36 new Wolverines. 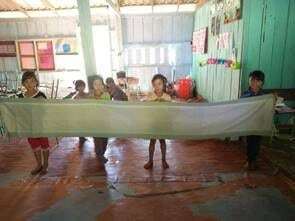 As you recall, our teacher Pongsak was moving to a new school, so we have a whole new group of children. Let’s start with the bad news – the school is in shambles. 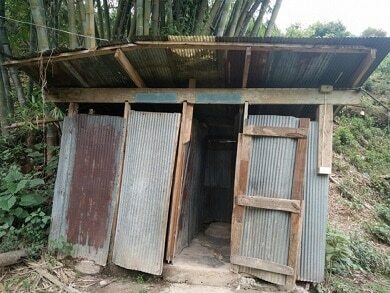 This is the school's restroom, which is much better shape than the kitchen. The children with their eggs on the first day of school. The good news is that we have a whole new group of children that we can help out. Our first goal for the program is to make sure that the children start each day with breakfast and a multi-vitamin. 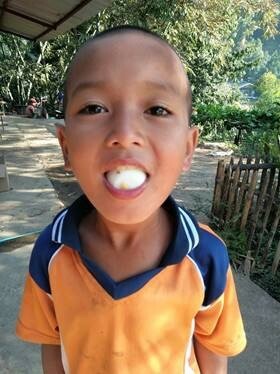 Pongsak sleeps in the schoolhouse, and on the second day of school he was woken up to a bunch of the children pounding on the door yelling Boi-Egg! Boi-Egg! (“Boiled Egg!”). These children do not usually get breakfast. The new village is traditionally underserved – there are ten remote villages in the district, and this village is the furthest out, so any charity efforts are depleted before they reach the last village. 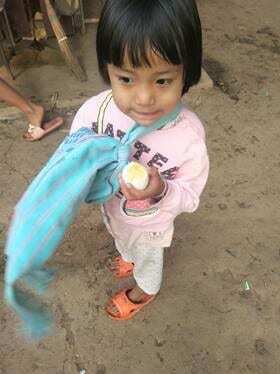 Interestingly, the village has good cell phone reception, so Pongsak and my wife can chat on a daily basis. I was eating breakfast yesterday with my family, and my growing boys had their usual pile of eggs, sausage, toast, and cereal. While we were eating, Pongsak texts my wife that some of the children told him that they never want to graduate to middle school. Why? “They don’t have breakfast there so that we will be hungry.” So there you have it. We are on the right track with the Wolverines program. Our teacher friend Pongsak is getting ready to kick off the school year at his new school next week. In preparation, he loaded up with a month’s worth of supplies with the donation that we sent for May. 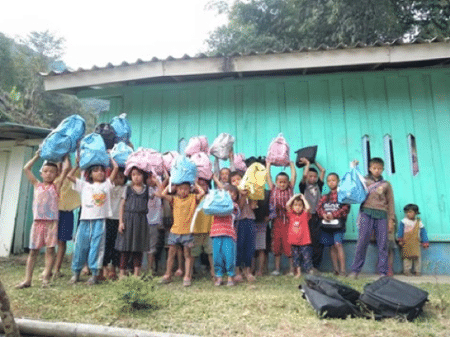 The kids at the new school have no idea that they are going to be Wolverines – Pongsak will show up on the first day with food, vitamins, books, and supplies to kick off the program. We also got a special donation this month of an extra 5000 baht from our friends Bob and Tracy at Hughes Hubbard & Reed. We used the gift to buy the books below (in both Thai and English). We are really looking forward to seeing the pictures of the new students! Just as Iridium has pivoted our business model multiple times, we are in the process of a major change in direction for the Wolverines program. Two people have been key in the progress achieved with the Wolverines Academy to date: Pongsak, a Thai school teacher, and my wife. 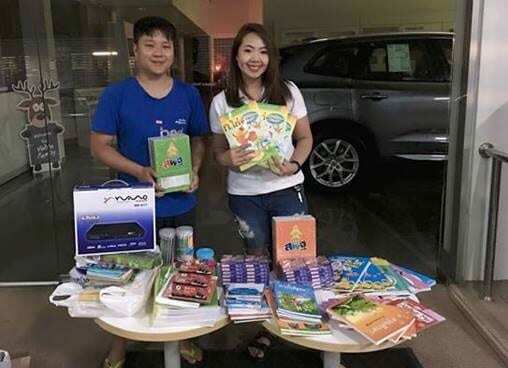 As I shared before, we were struggling to find a Thai teacher or administrator who was willing to work with us, so we were ecstatic when we connected with Pongsak. We were settling into a nice working relationship with Pongsak and doing a lot of good for 23 school children when Pongsak was informed that he was being transferred to another school. My wife and I had already become attached to these 23 children, so we wanted to figure out how we could keep supporting them. 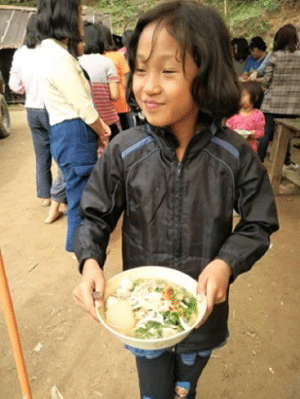 My wife and Pongsak evaluated the options, but the unfortunate reality is that without Pongsak in that village there is no one to keep the program going. As a result, we are turning our focus to the new school where Pongsak will start next month. There are 50 students in the new school, and we are going to focus on the same goals: protein for breakfast, multi-vitamins, and ensuring the children have a little fun. Ingredients to make egg rolls. Unbelievably, the children never had an egg roll in their lives. My wife gave Pongsak the recipe and made a video showing him and the children how to cook them. My wife and I are going to miss these children, but we need to put our focus and energy where Pongsak can make an impact. We remain committed to our vision of “franchising” the program to other schools and have told Pongsak to keep an eye out for teachers at other schools that have the “can do” attitude to set up a second Wolverines Academy. It took some doing, but at this point, I can say that the Wolverines Academy is live! 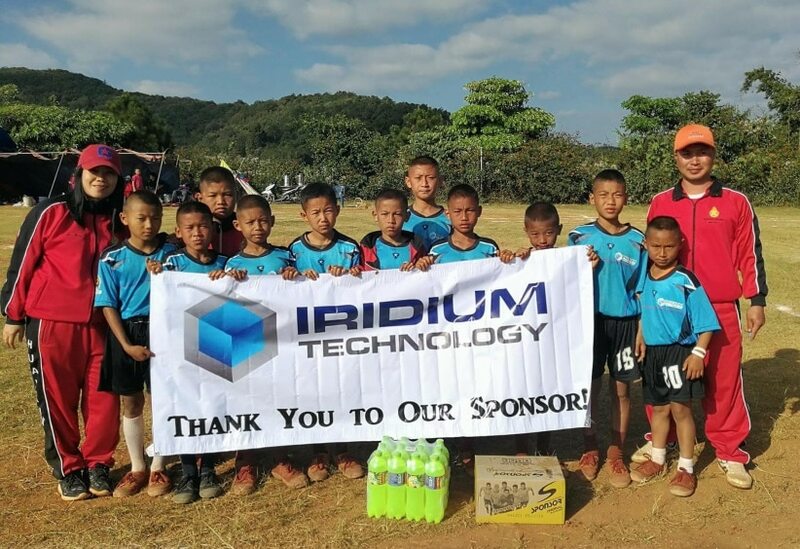 As you recall from a previous email, we were able to connect with a school administrator in a remote region of Northern Thailand, and our first contribution was to get soccer uniforms and Gatorade for some children. I am off to a good start, right? The next step was to talk to the school administrator about my real goal to help the most impoverished kids by improving their nutrition, starting with a good breakfast. This is where it all fell apart. Rather than trying to find a working solution, he could only come up with a list of reasons why we couldn’t do this. In frustration, I told my wife that we needed to get in touch directly with a teacher that had a “can do” attitude and would get some results. My wife was on holiday in Thailand, so she made a bunch of calls to teachers, principals, administrators, etc. The response was universal: no one has done this before, it seems complicated, I would have to get approvals, bribes might be required, etc. A complete dead end. Step number one was a test run. 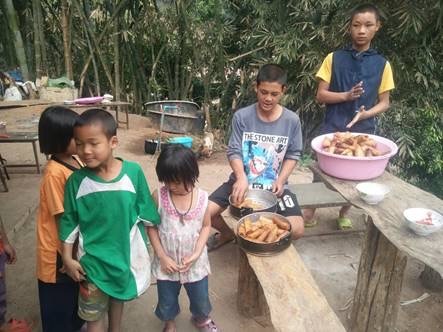 I sent Pongsak $100 USD and told him to get protein for the kids, send us an accounting of how he spent the money, and send us pictures showing the kids with the food. He executed beautifully. He purchased a hundred eggs, a couple dried fish for each family, fresh pork for a special meal, rice, potatoes, packaged goods, and some school supplies. He provided a full accounting of the spending and sent twenty pictures of the kids, including the photos below of them enjoying their eggs. He had $3 left over, so he used that to buy popsicles for the kids when the “ice cream scooter” came through the village, another rare treat. 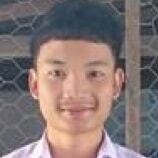 Pongsak is 28 years old, and his salary as a teacher is $200 USD/month. He gets occasional donations of food or gas for the generator and is raising the three orphans. The school has a garden and a small fish pond to help feed the kids. He routinely pays expenses out of his pocket. My wife has been calling him each Sunday when he has internet access to discuss next steps. When we told him that the test was a success and we would double the amount next month, he argued that it was too much. I still have a plan to improve the lives of these children through English language instruction and other activities. My long-term goal is to have a “franchise package” that can be rolled out at other schools. Now, the story again takes an interesting twist. Just when it seemed like everything is on track, we got an update from Pongsak. Six of the children that were 13 or older were taken out of school to work on the family farms. Unfortunately, this could be called “graduation.” Since the school now has only 17 students, Pongsak is going to be moved to another school. This put me in a dilemma. 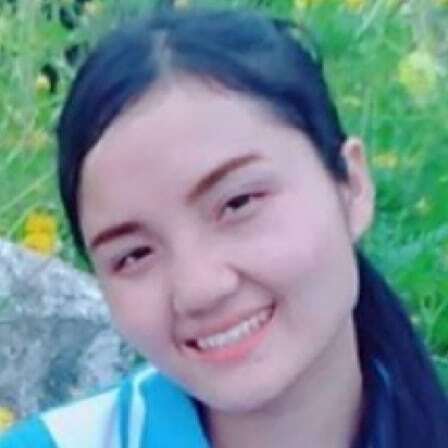 Pongsak is the person that I want to work with, but if I moved our efforts to the other school, I would be abandoning the children that I had just started with. So, the franchise effort is now beginning. I have agreed to sponsor a second school that has 50 students. We will start with sending $200/month to sponsor both schools, and Pongsak confirmed that this would have a considerable impact. A friend of mine in London is on the Board of Directors for Build Africa, a charity that is running great programs in poor rural schools in Africa. They said I should shamelessly steal all their ideas to help my Wolverines, and they sent me a bunch of their newsletters. One of their most successful projects is to provide feminine hygiene products to the older girls, so they don’t have to miss school when they have their monthly cycle. Well heck, I didn’t think of that one. Add it to the list of supplies that we need. I will be working with Pongsak to have a monthly shopping list: eggs, protein, toothpaste, feminine hygiene products, multivitamins, etc. And once we have some solid nutrition in place, we will then start to work on some of the academic efforts. Pongsak does not speak English, so special thanks are in due to my wife for helping me pull this together. Last thing: I was able to work with a graphic designer in Malaysia through Upwork to get our logo. Go Wolverines! We all receive messages at times. Setting aside religion, let’s use “the universe” as the source of these messages. I believe when you receive a message, it is imperative for you to act on it. The Code of the Extraordinary Mind presented this concept very clearly. The author proposes that when a plan comes to you, it was meant for you, so you are expected to act. It is impossible to know where the idea is going to take you, but the important thing is to take the first steps towards making the idea a reality. The universe will then guide you in two ways – gentle adjustments to your plan, or substantial body slams that cause you to change the direction of your strategy entirely. Let me give you some examples of how I have personally seen this occur in my life. The first instance is Iridium Technology. When the company started out, I was one guy trying to establish a consulting firm that focused on implementing the ADERANT ClearView product. I never expected that eight years later we would have 30 team members and a product line of our own. I received critical input on numerous occasions that enabled me to make small adjustments and significant pivots, which ultimately resulted in the company’s current state. Following that logic, it is best for me to acknowledge that I have no idea where Iridium will be in five years, so I will continue to work hard and enjoy the ride. The second example is Operation Sam’s Club. The first year we organized a collection drive for deployed troops, it was my two boys and me, and we collected about a hundred pounds of donated goods. Taking those first steps helped me make connections that enabled Operation Sam’s Club to eventually deliver over 10 tons of donations to our deployed troops. Again, this result was better than what I could’ve envisioned. The last example is that when a friend of mine gave me the email address of a cousin in Thailand, I never imagined that woman would end up becoming my wife. Once again, I took action and initiated the communication that led to our marriage. These three examples illustrate that by listening to your messages and taking the first steps, you can achieve tremendous results. In the past three months, I have received two clear messages. The first was an idea for a new Iridium product, for which the Iridium team is already going full blast on the development effort. The second was related to Iridium Scholar Yuwadee’s upcoming graduation in May. With that sponsorship ending, I was ready to embark on a new project. I decided that I needed to adjust what we did with Yuwadee. Specifically, rather than helping one young person, I wanted to figure out how to help a group of children break the cycle of poverty. This message came to me about three weeks ago that I should set up an orphanage in a developing country to help disadvantaged children. From what I’ve read, the goal of many orphanages is to keep the children alive and off the street until they are 18 years old. I envisioned providing much more than that. My idea was to set up a curriculum that would give children the skills needed to thrive once they left the orphanage. All instruction would be in English, which would enable them to get jobs that would otherwise be unavailable to them. We would build grit, focus, and self-confidence through martial arts instruction. We would also establish a curriculum that focused on life skills, visualization, goal- setting, and the value of hard work. And we might even be able to teach computer science and coding. Sounds great, right? I was ready to take the first steps and see where the universe would guide me with my plan. The first thing I did was call a family meeting, and share my plan with my wife and two boys. I proudly shared my enthusiasm and told them everything I was going to accomplish. They responded by delivering a massive body slam to my plan. They pointed out all the reasons why an orphanage would be difficult, with the two most significant being government regulations and religious implications depending on the country I selected. My primary choices were Mexico, Thailand, or the Philippines. They were right! I thanked them for their input and told them that I considered course changes to be part of the regular process. The next morning, I came back and shared my ideas about an after-school program, with the premise that children will attend the program until 9:00 PM, plenty of time for intensive tutoring, a healthy dinner, English language instruction, martial arts, and life skills education. My family thought that this new plan sounded a lot better, but I know that there are still a lot of adjustments to be made as it evolves. the modified plan to my family, and she came across the equivalent of a GoFundMe site for charities in Thailand. One of the opportunities to donate was for a group of children who needed soccer uniforms to attend tournaments. My wife asked if this looked like it was a good match for what I wanted to accomplish. I asked her to get in touch with the contact to see if we could put a Wolverine logo on their uniforms. He said, “Sure thing!” I then said that I wanted to make sure all those children have ice cream after every match. The contact responded that the children live in an impoverished area and the nearest ice cream shop is 30 miles away, but they could get some Gatorade. Done deal. I wired them the funds to cover the uniforms, the Gatorade, and the gas to get them to their matches. Four days later they were playing soccer in their new Wolverine uniforms! So now I have to ask you, “What are the chances that Tom would come up with this idea for a Wolverine after-school program, and two weeks later a bunch of children in Thailand would be playing soccer after school in Wolverine uniforms?” Let’s go with one in ten thousand. That is the power of first steps. Sometimes the way the universe helps you along with your projects is just stunning. I remember my efforts with Operation Sam’s Club, the drives that I organized to collect donations for deployed troops. In the second year, we moved to gathering in front of Sam’s Club. We had great success, with 100 boxes shipped overseas. Shipping costs ended up being $1,200. With the help of my family, neighbors, and other generous individuals, I received exactly $1,196 in donations over the next two weeks. The universe served up exactly what I needed. I had one thing that I needed to clean up, and that was a better Wolverine logo. I didn’t like the Michigan State logo, and I didn’t want to commit copyright infringement. I searched on Google for a new logo that I could license, but I didn’t find any logos I liked. Two days later I went to the gym, and when I put my backpack into my usual cubby, there was a folded grey sweatshirt in the cubby next to mine with a “Coleville Wolverines” logo displayed. It was a nice-looking logo, and I thought it would be a good starting point to build a new logo. When I got home and looked up Coleville Wolverines on Google, and there were no matches. In a strange coincidence, however, the “Coleville Wolverines” search turned up a logo from a high school in Utah that served as a good starting point for my new logo. Somehow the perfect clue for me to find my logo is put right next to my cubby, with the logo facing up, from a team that no longer even exists. The chances must be one in a million. The final question is “What are the next steps?” I had my wife call the school administrator that connected us with the soccer team. Our contact is a school administrator in Chiang Mai, which is in Northern Thailand. In the 100-km radius around Chiang Mai, there are 119 distinct tribes of Thai Aborigines living in small villages. The soccer kids are in one of these tribes. Very few of the parents speak Thai, but the children learn Thai in school. Many of the parents do not have Thai ID cards and are therefore not eligible to receive any social service benefits, are excluded from most jobs, etc. These people typically live as subsistence farmers raising rice and eggplant. They live in houses built from bamboo and other scavenged materials. There is no electricity or running water, and the wealthiest family in the village might have a scooter. Most of the children get married when they are 16 and start having families right away. They get very little protein in their diet, which probably explains their small stature. My wife asked if any of the kids in those tribes ever made it out of the village and went to the university, and the response was that it happens occasionally, but it’s rare. My wife and I have committed to learning more about these people to put together a focused plan on how we can best help them break the cycle of poverty. I have no idea how this program will evolve, but I’m sure that I will get plenty of input to guide me in the right direction.